You know what's quick and easy and delicious? Stir Fry! 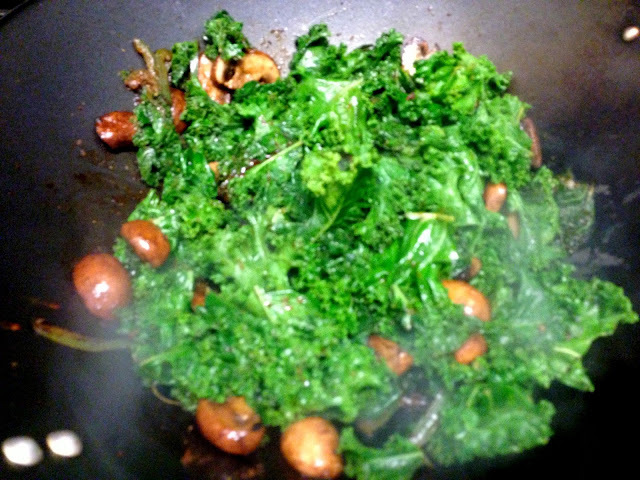 Plus, this one has kale in it, so you can spend the rest of the evening feeling smug about your healthful cooking. Win win. You'll see that I've listed the ingredients in the order they go into the wok (and separated the sesame oil because it is used on two separate occasions). You want to keep them all handy and organized because stir frying is super quick, and you don't want to let any of your ingredients burn while you scramble to find the rest. This dish would be just as delicious and totally vegetarian friendly if you just increased the mushrooms to 2 cups and skipped the pork altogether. Slice the pork chops against the grain into thin slices. 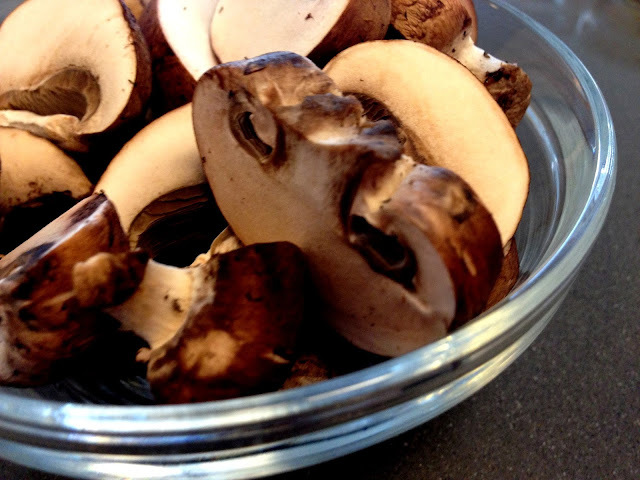 Prep the mushrooms by wiping them with a damp cloth to remove any bits of dirt and slicing them into halves (or more if they're larger). Prep the kale by cutting out the stems (discard these or, if you're homesteady, save them for a stock or a soup) and roughly chopping the leaves into 1-2 inch pieces. Rinse, but don't dry it. Remove the seeds from the jalapeno pepper and slice thinly. Heat your wok (or large skillet would work as well) on high and add 1 tbsp sesame oil when the wok starts smoking. Swirl it around to coat the wok. Add in the pork and cook for 2-3 minutes (it should turn brown). Remove and set aside. Add the sesame oil, swirl again, add garlic and jalapeno, and lower the heat to low (watch out for splatters!). You want to just get the garlic golden brown. After 10 seconds add the ginger. After another 10 seconds, raise the heat to high and add in the mushrooms. Stir for about a minute. Add in the kale, stir and cook for 3-4 minutes. Add the pork back in, along with the lemon juice, soy sauce, and hoisin sauce (you don't need additional salt because these sauces will give you plenty of that). Stir and cook for a minute. 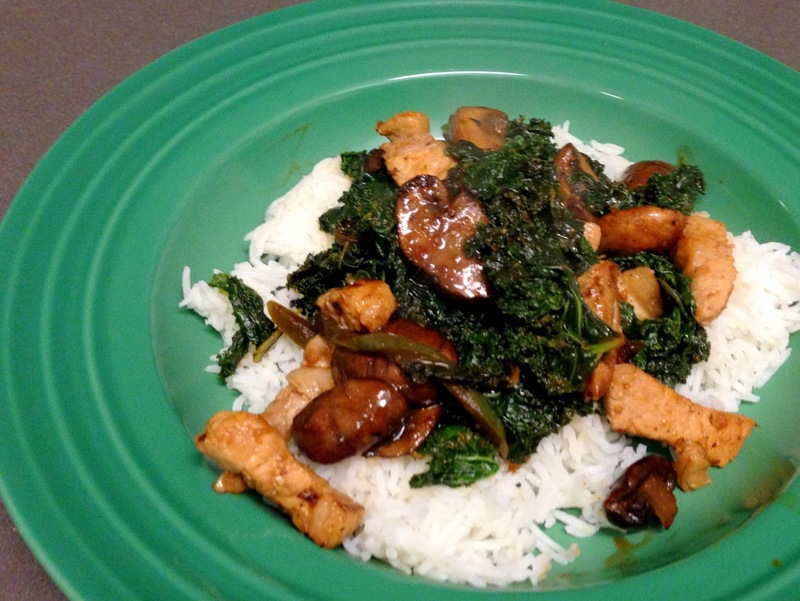 Take off the heat and serve immediately - the pork is cooked just so, the mushrooms are deliciously meaty and tender, and the kale is juicy with the sauce clinging to it. Mm mm. Great!. This is the Recipes For Stir Fry that is perfect for my family because they really love eating mushroom recipes. I will ask my mother to help me to cook this one because I admit that when it comes to cooking I'm not totally great. Thank you for sharing this with us.